Smartphones have changed teen life, but is it as bad as the Atlantic says? Already, experts on media and kids are cautioning against alarmism, using this as a teachable moment. In Psychology Today, Sarah Rose Cavanagh points out that Twenge’s evidence is “cherry-picked” and drawn from correlational research that does not show smartphones to be the cause of depression but instead shows “merely observed associations between certain variables.” And over at JSTOR Daily, Alexandra Samuel displays several charts that demonstrate how teen happiness has taken a slight dip but on the whole is not all that different than it was last decade or the decade before that. And yet. As the mother of two teen girls, ages 13 and 15, so much of Twenge’s article felt like a video replay of my household. Twenge writes, “The arrival of the smartphone has radically changed every aspect of teenagers’ lives, from the nature of their social interactions to their mental health.” There’s no denying the changes wrought by the smartphone. I see them every day. My daughters are on their phones when they wake up, throughout the day, and into the night. My 13-year-old won’t go to bed until she has Snapchatted a silly photo of herself to multiple friends to keep up her streaks. My 15-year-old’s phone is constantly vibrating from messages coming in from group chats. Our family dynamics also reflect another big generational change getting far less attention than mobile media mania: My daughters, their father, and I have somehow developed an increasingly rich vocabulary for talking about depression and mental illness. Dinner conversations and car rides will often touch on our loved ones’ mental health, anxieties, and needs to find spaces for reflection—conversations unlike anything I recall from my teen years of the ’80s and ’90s. Across our society we see a dawning awareness of depression—from suicide prevention walks to a lack of stigma about seeing a therapist to an increasing sophistication among professionals about how to evaluate symptoms. Could that awareness itself be affecting identification of depression? 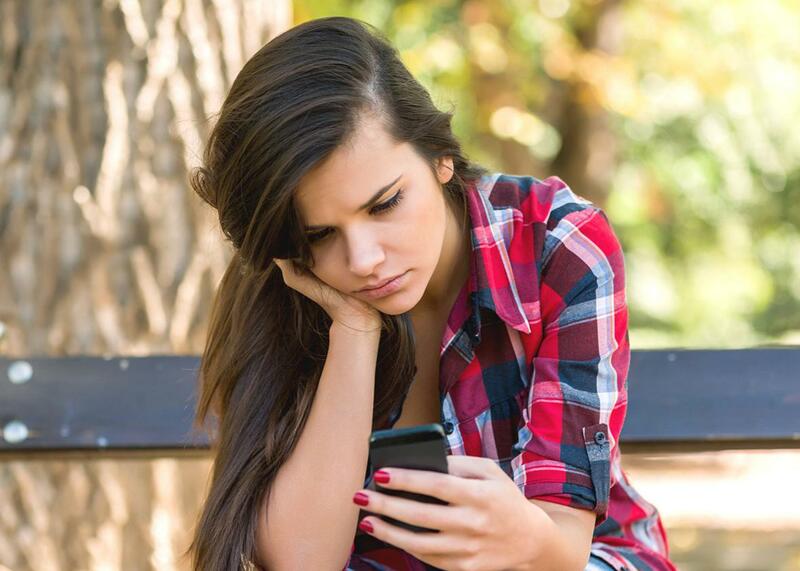 Could it be affecting our teens in unintended ways? Clearly, at least in my house, it is already affecting my parenting. Unfortunately, these two phenomena—the rise of new media norms combined with modern society’s attempts to understand depression—may be leading us down some unproductive paths. I suspect that we parents feel trapped because the solution seems so binary. It’s as if there are just two paths to take here. There’s the laissez faire route: “Don’t worry about it, kids are kids, at least they’re not doing drugs, let me get back to my own phone.” Or there’s the impossible one: Wrench those phones out of your teens’ hands and tell them to go straight back to 1985, right now, no backtalk. Neither of these seems terribly promising. Finding a third way will require keeping a level head about the limitations of the research (more on that in a moment). But it may also mean really talking to our teens. You’re right, I told her. I get it. As a Gen Xer, I said, I remember feeling so piqued and helpless when demographers started telling me what was wrong with my generation. And millennials, in case you haven’t read the hundreds of missives going around Twitter these days, are similarly irked. The risks of overgeneralizing are legion. My daughters and I are part of a middle-income white household in Northern Virginia; the diversity of other family experiences around the country needs much more serious study. Another risk is ignoring the Three C’s: the content, the context, and the individual child. For Janelle, the nature of the content coming through the phone matters a lot. Not only is she exchanging text messages with her friends (both deep conversations about their lives as well as throwaway one-liners while watching TV), but she is also using her phone and laptop to seek out and read up on issues she cares about, such as social justice and the environment. It was an admission that yanked at my heart. To me, the question is not, What can I do to get her off her phone? The question is, What is causing that loneliness? But finding two data points that happen to appear at the same time is not equivalent to finding that one data point derives from the other. There is association but not causation. For years, surveys of television watching and obesity led to headlines about TV watching causing obesity. But when researchers dug deeply into the findings, that certainty evaporated. One unanswered question was, could obesity be causing TV watching instead of the other way around? Another line of inquiry examined the content on TV, looking at how the advertising of food (sugary cereals, for example) could be playing a role. That research led to more fruitful routes for intervention, culminating in a 2006 report from the Institute of Medicine, Food Marketing to Children and Youth: Threat or Opportunity? So for our teens, we need to better understand what is causing what. Are social media and the convenience of our mobile devices causing young people to be more depressed? Or, could it be the other way around: They already are more depressed, and they are turning to their phones for solace? Of course there’s also a third possibility: Maybe there’s a nefarious reinforcing circle here. Where is the end, and where is the beginning? Twenge’s 2010 research raises the specter of a problem much bigger than that rectangle of metal and plastic in our hands. In 2012, Brandon H. Hidaka, a scholar from the University of Kansas Medical Center, looked at the prevalence of depression diagnosis and wrote: “Declining social capital and greater inequality and loneliness are candidate mediators of a depressiogenic social milieu. Modern populations are increasingly overfed, malnourished, sedentary, sunlight-deficient, sleep-deprived, and socially-isolated.” Fast forward five years to the harsh language and interactions that play out from President Trump on down, and most would agree that the way we work together and care for each other needs repair. Hopefully Twenge’s article and her upcoming book will not add to teens’ worries. At the heart of many of my daughters’ comments, and those of her friends, was the prospect of parents taking away their phones. “Honestly, many of us are sick, and I’ve seen it firsthand, but taking away your teen’s phone and telling them it’s to protect them is the perfect way to hurt your chances of discussing mental illness with them in the future,” Janelle told me. Don’t worry, Janelle, I won’t be taking your phone. I’m just grateful you can talk to me about it.